APT MOBILE SATCOM LIMITED（can be called as APSATCOM）was founded on 23rd July 2016. 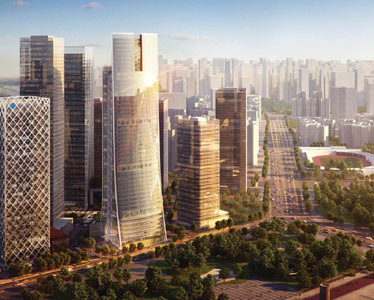 The registered capital is 2 billion RMB and the total investment will be over 10 billion RMB. 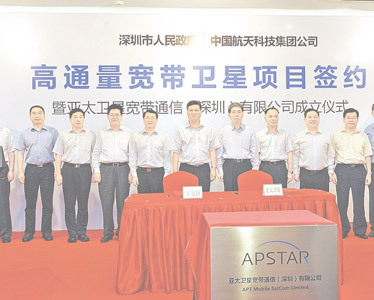 APSATCOM will provide the high-quality, efficient, cost-effective communication services and various applications for maritime, aviation, land mobile and satellite broadband internet access in isolated areas. APSATCOM is a reliable and professional communications service provider. It has a communication expert team which is domestic leading and first-class of the international; has an engineering team which is well experienced; has a management team which is efficient and capable. 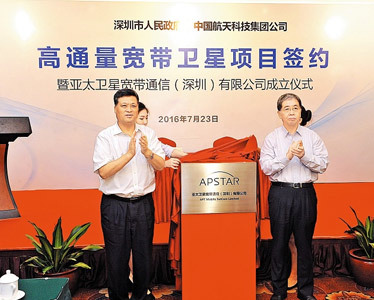 Ma Xingrui (left), then Deputy Secretary of the Provincial Party Committee and Secretary of the Municipal Party Committee, and Lei Fanpei, Chairman of China Aerospace Science and Technology Group Company, unveiled Asia-Pacific Satellite Broadband Communications (Shenzhen) Co., Ltd. Responsible for the planning and implementation of intelligent shipping communication project. To be responsible for the strategic development of the water transport direction of the transportation industry, the research of intelligent shipping and intelligent ships, and the writing of relevant reports. 4. Strong writing ability, able to organize and complete engineering feasibility study report, etc. Responsible for financial analysis of the group; To supervise the budget implementation and make summary analysis; Research fund utilization efficiency and dynamics; To formulate project financing plans and medium - and long-term capital utilization plans of the company; To be responsible for internal and external tax planning. 6. Holder of valid CPA certificate, international accounting certification, English proficiency is a plus. Project management of BOSS system construction; Collect, summarize, analyze and extract functional requirements of BOSS module construction; Organize internal and external personnel and third-party personnel to complete system construction tasks on time; Operation, maintenance and management of each module of BOSS system; Collect and analyze internal data of the system, provide reasonable Suggestions for business and product planning. Responsible for server configuration, maintenance, monitoring, tuning, etc. Troubleshoot service failures, system failures and network failures during operation and maintenance; Participate in operation and maintenance automation project, assist to develop operation and maintenance script; Participate in the construction of operation and maintenance support platform, including operation and maintenance tools, background data statistics platform. Participate in the implementation of communication projects. 5. Excellent logical thinking and language skills, English proficiency is a plus. Web design, development and testing of products and services; Develop and maintain its own front-end framework; Support device-side WEB GUI development. 3. Excellent logical thinking and language skills, English proficiency is a plus.